Code organization is more an art than a science. See how the folks over at Hello2morrow do it here. A service would only expose its service ad its model layer to the outside. 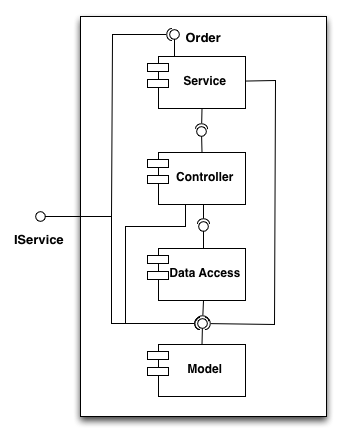 The service layer contains all the service interfaces and talks to the controller and the model layer. 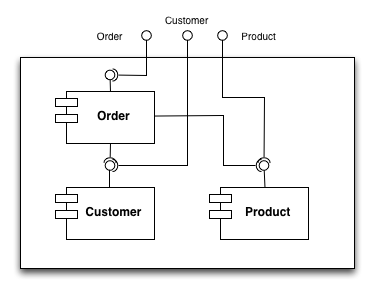 The controller layer contains all the business logic and uses the data access layer to retrieve or persist data using JDBC. The model layer defines the entities used by our microservice. Please note that we declared “Model” as a public artifact. That saves us the need to explicitly connect all the other layers to “Model”. Also note the “require” statement. Here refer to a third architecture file, that contains the definition of the artifact JDBC. This way we can ensure that only the data access layer can make JDBC calls. Using “require” will only declare the artifacts contained in the required file, but not define them. This means that the artifacts in “JDBC” have to be defined on another level. The interface is used to define the exposed parts of a subsystem. When connecting to the “IService” interface you have only access to the “Service” and the “Model” layer. We also apply “JDBC” in the outermost scope to ensure that the artifacts in there are defined exactly once. As you can see it required relatively little effort to create a formal and enforceable architecture description for a software system. If you want to learn more about our architecture DSL, I recommend reading a series of blog posts introducing the different concepts of this powerful language. What Are Good Books on Best Practices of the Design of Domain-Specific Languages? Published at DZone with permission of Alexander Von Zitzewitz , DZone MVB. See the original article here.